When noted comic book writer Steven Seagle finally gave in and agreed to write for the legendary Superman, he did so on his own terms: as a frail, vulnerable human being searching for strength. Seagle's highly acclaimed new DC/Vertigo graphic novel It's a Bird features a cover logo by Charette's New York partner Pete Friedrich. This thinly-veiled autobiographical graphic novel, painted brilliantly by Copenhagen artist Teddy Kristiansen, is a reflection on power and powerlessness. Seagle deconstructs the classic Superman genre (see right) through the lens of his own family's battle with Huntington's Disease as arch enemy. According to The New Yorker, this is "Superman for grownups." Charette's comic book design work in developing the "It's a Bird" logo design for the front cover, started with first looking at the classic Superman logo that makes up the "last son of Krypton's" graphic heritage: 3D perspective letters and the famous big red "S" (see sketches below) before finally settling on a crumpled piece of paper from a reporter's notebook. Friedrich: "I went inside the writer's character who is walking toward the reader on the cover, oblivious to the embedded Superman references all around him... the reader with whom he is about to collide. I thought, what would be on this notepad he's writing? Design sketches went from being more referential of Superman to more evocative of the main character's struggle with the greatest superhero's powers. For starters, this is a main character, the writer, who at first can't even get Superman's "Faster than a speeding bullet" motto right. DC's Art Director Amie Brockway-Metcalf thought it would be great to include his scratched out words leading up to "It's a bird." Friedrich adds, "the writer is really struggling to find his muse within the Superman ethos which has painful associations with his childhood — reading comic books while sitting in hospital waiting rooms. I imagined him writing and crumpling a LOT of paper to get through that situation." 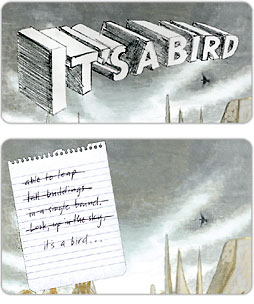 Friedrich, a long-time comic artist himself, took special pride in working on It's a Bird. "I've worked on Captain America, Ghost Rider, and Conan the Barbarian as well as many underground and alternative comic books. So I always wanted to work on "the other side of the tracks" at DC Comics. But working in the Superman line — in any context — is the zenith for many of us comic fans. Once I read Steven Seagle's manuscript I knew we were into an entirely new area of discussing Supeman." Steven Seagle has his own thoughts on messing with Superman. He told NPR's Terry Gross: "I really wanted to see if Superman could handle whatever I threw at him. He is so good and clean. He is an ideal, wholesome and enduring. This world we live in is so morally gray, so unknown."